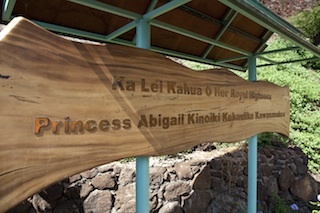 One of the features on the pathways is the Princess Lookout and the Princess Lookout was a gift to Princes Abigail Kekaulike Kawananakoa. And it overlooks the whole Health Center, but the symbolism in the gift is really expressed in the poles of the structure. Those poles that are on the ocean side represent her “Kahili” or her feathered standards and those standards are carved three dimensionally and has the colors of her Royal Kahili. The Kahili on the right side (facing the ocean) is yellow and red, and Kahili on the left side is black and red. The center pole is the family “Aumakua” (spiritual guardian) - the “mano” – the shark depicts a shark swimming and leading the people of Hawaii. The glass eyes represent clarity and the seer to find the way. The mauka facing poles or the poles toward the mountain represent the domain of the Princess. The multicolor that you see in the pole, in the stripes represent the colors of the different islands. Red is Hawaii, pink is Maui, green is Molokai, yellow/orange is Oahu, purple Kauai, white-Niihau, Kahoolawe is gray and it just shows her domain over these islands. The copper strips around the outside poles are the “Pewa” or butterfly patches. These signify healing, such as the patches that bind together and heal a cracked umeke or waa. This symbol has become the logo for the Native Hawaiian Traditional Healing Center. The center pole on the back side of the platform represents her rule. The copper insignias simply are her Royal crown and insignia. The lau ki and the leaves are shown as spiritual guidance to the Ali’i. The painted and carved symbols in the pole are three basic medicines of traditional healing: clean air, clean water and the Kalo, representing food as medicine. Combined it reads the Monarchy ruled over the land, water, air, and the Ali’i were blessed and guided by the Creator, represented by the wrapped lau ki. The Kalo plant at the base of the pole, symbolizes the sacrifice of Haloa to feed the people. The aura around the plant represents sacredness of the food.